Literacy in science has always been a huge focus for me. Not only is literacy a priority area for our school, but I like to be educating my students so they are young scientists and there’s nothing more important to a scientist than to be able to understand and communicate their ideas clearly. I personally find reading and writing to be the easiest to integrate into high school science. However, listening and speaking are a little harder for me to embed. Just a few days ago I remembered a strategy called running dictation which I learnt from an English as a Second Language consultant a few years ago. 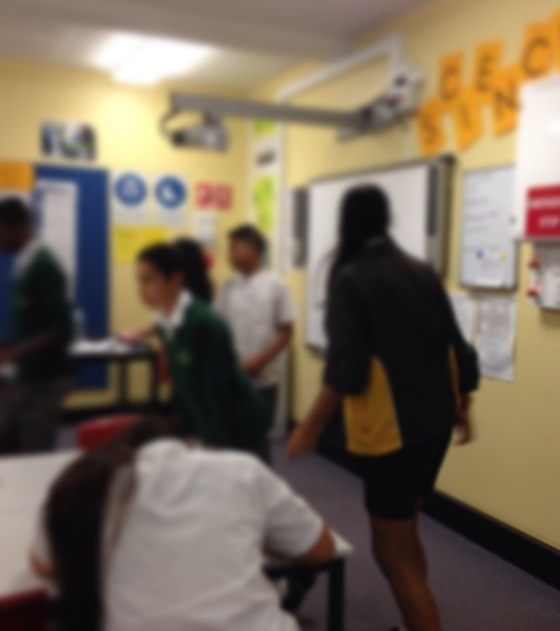 Running dictation is a game that students play in groups to practise their reading, writing, listening and speaking skills. The teacher puts a short passage somewhere in the classroom (in my case it was a passage on the atmosphere). Each group of students selects a reader and the rest are writers. The readers in each group need to run (or in my classroom, walk very fast as I don’t want any injures) to the passage, read it silently to themselves, remember as much as possible, run back to their team, recite what they remember to their team and the rest of the team writes it down. The first team that gets everything correct (the words, spelling, punctuation, etc) wins. You might think it’s a noisy game but because each team doesn’t want the others to hear and steal their work, they work very quietly. I did this with Year 8s the other day and they absolutely loved it. I like how it allows students the opportunities to work together as a team and speak about science. I know running dictation isn’t new but I haven’t seen it used in science classes so I’d thought this blog might give other science teachers some ideas for literacy. I find that running dictation allows students to read, write listen and speak science in a fun way. It’s gets them up and moving and doesn’t make literacy seem like a drag like it sometimes is. In future lessons I’m going to try some of these other ideas for running dictation to make it more challenging for my students. Formative assessment is something I’ve been putting a lot more emphasis on over the past few years. I’m so sick of just relying of end-of-topic exams to gauge what students have learnt. I want my students to continuously question how they are going and make changes to their learning accordingly. This is one of the reasons that my faculty has embarked on a Structured Observed Learning Outcomes (SOLO) journey this year. 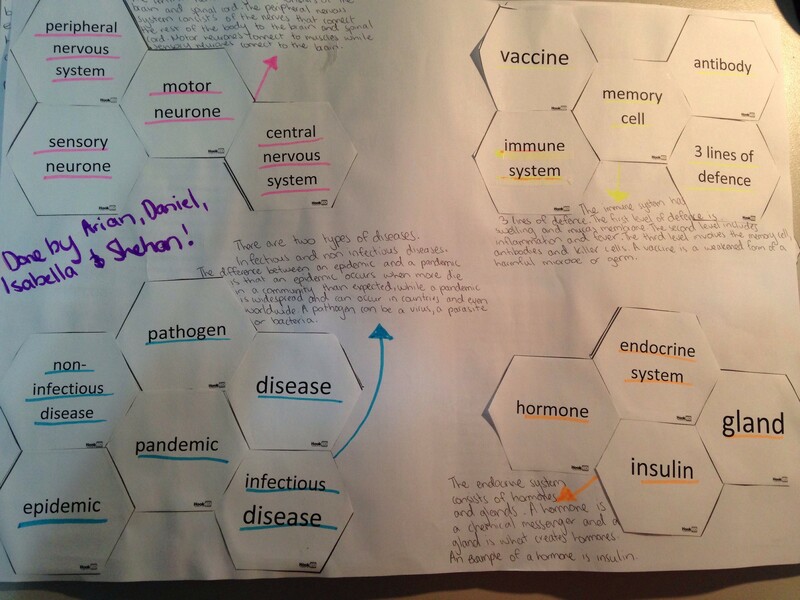 One of the ways that many teachers using SOLO use to assess student learning is with SOLO hexagons. SOLO hexagons involves the major concepts or ideas from a topic to be placed individually onto hexagons. Students then work individually or in groups to connect the hexagon concepts together and they must justify why they have made these connections. It is the justification where both the teacher and the student can assess the student’s learning. 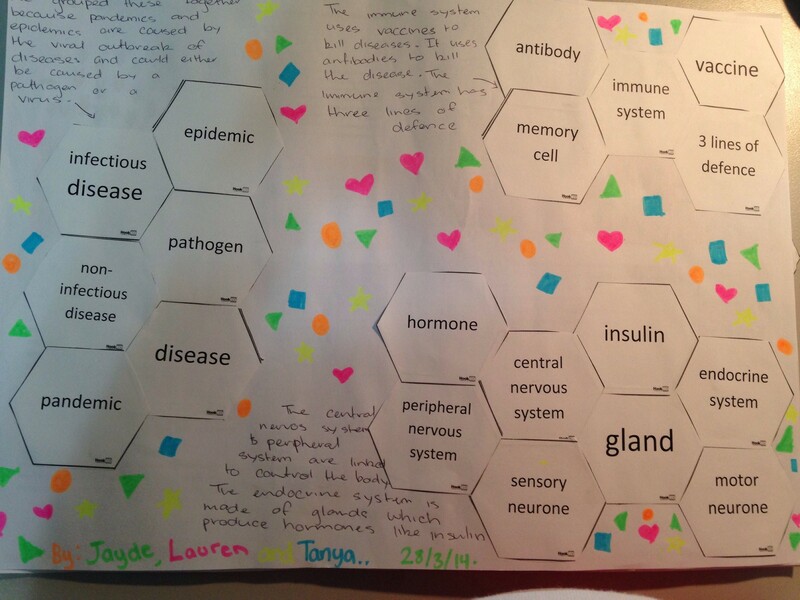 It is how students have connected the hexagons and their justification of WHY they have done it that way that allows their learning and thinking to then be assessed using the SOLO taxonomy (or not; the hexagon activity still works with no understanding of SOLO). Here’s a video showing one way of using the SOLO hexagons in a UK science class. Here’s an explanation of how to use SOLO hexagons from the SOLO guru, Pam Hooke. 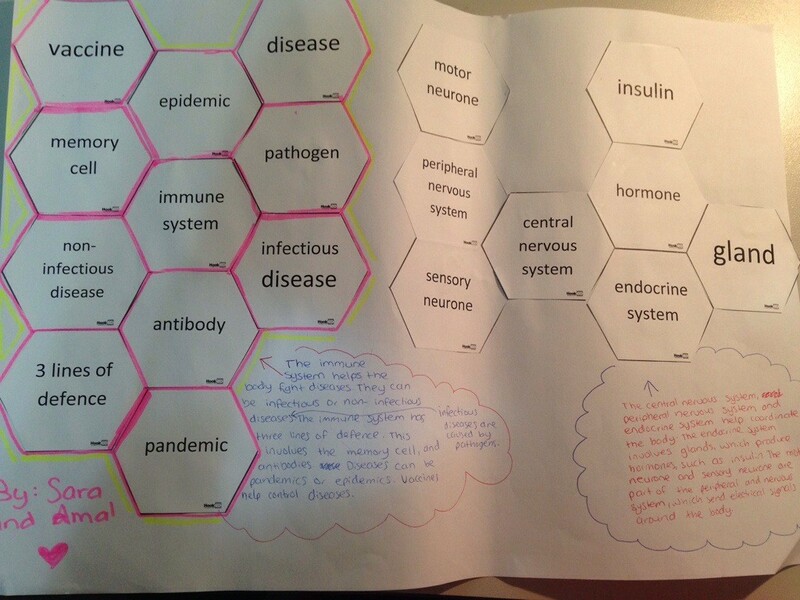 I changed the hexagon activity slightly to suit the needs of my students. The picture shows the instructions that my students received. And here are the hexagons my students used (note that the hexagons were pre-cut for students and placed into zip lock bags with the above instruction card). My students worked in groups of 2 to 4. I used the SOLO hexagon generator to create the hexagons. Here’s some samples of the hexagons my students made. Some groups connected all the nervous system concepts and the endocrine system concepts together, showing they had an understanding that the nervous system and endocrine system worked together. However all the groups had the immune system concepts separate altogether. I did spend a lot of class time making it explicit that the nervous system and the endocrine system work together to control and coordinate the body. And while the students’ project was to make a fact sheet about how a particular disease/health issue affected the nervous system and the endocrine system, they seem to think that the immune system works on its own and is completely separate from the other systems. From this activity we discussed their SOLO levels of understanding and how they can use their hexagon connections to see whether they were at a unistructural level, multistructural level, relational level or extended abstract level. Most students concluded they were at a relational level for most concepts and some thought they were extended abstract for some parts of the topic. The SOLO hexagon activity is definitely something I will use again with my students. Now that they have done it once, the next time will run even better. Feedback from students was that they enjoyed talking about science with each other and that they learnt a lot from each other just by listening to what others had to say about each concept. This year my faculty have been designing units of work for the new NSW science syllabus for the Australian Curriculum with the Structured Observed Learning Outcome (SOLO) framework. (If you don’t know what SOLO is, watch this video for a crash course) The reason why we are investing quite heavily into SOLO is because as teachers, we know that self-regulation and quality feedback are the two of the most effective elements in increasing student achievement. SOLO, with its associated learning intentions and success criteria, will allow our faculty to develop our students’ self regulation skills and further improve the quality of teacher feedback and peer feedback. For most of the year, we have been designing learning with the SOLO framework so that each series of lessons have learning intentions and success criteria catergorised by the different SOLO levels of thinking and understanding. A couple of weeks ago, we went a step further. The whole faculty sat down and designed an agreed approach to how we will use these learning intentions and success criteria. As a team, we decided learning intentions, success criteria and SOLO were examples of best practice, but we need to ensure that it filters down to every individual student. We agreed that learning intentions, success criteria and SOLO must be high visible and evident in everyday teacher practice for it to have maximum impact on student achievement. At the start of a topic, students are given a list of the learning intentions and success criteria for the whole topic so they know where they are headed before they start learning about the topic. Each lesson will have the specific learning intentions and success criteria displayed. This can be written on the board, or displayed via a data projector or interactive whiteboard. The teacher will explain the learning intentions and success criteria to students at the start of the lesson. At the last 10 minutes of the lesson, students are to reflect on whether they have achieved the success criteria for the lesson and what they need to do next to be successful. As a team we also agreed to providing student feedback using the SOLO framework. More students moving from a fixed mindset to a growth mindset. Many students have a mindset that they are “not good” at science. We want our students to realise that to be good at science, there needs to be a certain level of thinking and learning that can be achieved with effort, as opposed to natural abilities. It’s part of making learning and thinking visible. Our faculty has also devised a draft plan to evaluate the impact of SOLO on students’ achievements and mindsets, with help from a university academic. So watch this space for more updates on our SOLO journey. There is a decline in student interest in science. Just type “students decline science” and hundreds of articles will come up of students not choosing to study science in post-compulsory schooling in countries like Australia, USA and the UK. At a time where technology is rapidly increasing and the world is facing issues like climate change, rapid rates of extinction, water shortage and food shortage, it is worrying to see students switching off science. What I find more concerning is my observations that kids love watching science YouTube channels at home in their own time, but they are not enjoying school science. Something is wrong. While the reasons below for why students are switching off science are not validated by any research data, they are inklings that I have based on observations of students and numerous student surveys completed at my school on their engagement in science. I think every science teacher is guilty of this. I certainly am. We often use showy experiments for entertainment to keep students engaged. Instead of promoting our subject as intrinsically interesting, we use colourful and bubbly experiments to “trick” students into liking science. How many times do we have students walk into a science lab and ask “are we doing an experiment today” and groan when the answer is no. Of course experiments have a place in science, but science isn’t about setting things on fire or making things explode. Science is a way of thinking and aligns with humans’ natural curiosity of understanding of the world around us. I think we have pushed science as a subject of fire and explosions for so long that this is what students expect and they are disappointed when a unit of work or a series of lessons do not have experiments. In NSW, Australia, Year 8 students do a state-wide test called Essential Secondary Science Assessment (ESSA). At the end of ESSA, students are asked to rank their favourite subjects. Since 2006, year after year the results show students like PDHPE and Visual Art the most. My gut feeling is that these subjects allow ALL students to experience some success. In Visual Art, it doesn’t matter if you are a not-so-good painter or if you are as brilliant as Picasso, every single student is able to produce an artwork, which is showcased. Same with PDHPE, it doesn’t matter how bad or good you are at sport, every single student have been part of a team that has won a game and experienced the excitement of success. Not so in science. In many science lessons, students don’t produce anything that can be showcased. Only a handful of student who are “good” at science feel success. A lot of students think they are “bad” at science. This is one of the reasons why I’m a fan of project based learning (PBL). PBL enables students to create a product that shows their learning and they showcase that product to an authentic audience. This give students a sense of success. Not many students see scientists in their everyday lives. They see bankers, accountants, lawyers but they rarely see scientists or associate jobs with science. In the surveys at my school, the most common reason given for not wanting to study science in post-compulsory schooling is that they don’t need science for their job or career. While we as science teachers know that many jobs and careers require some understanding of science, do our students know? Do we link our students to current practicing scientists so they can what they learn in school is actually used in people’s jobs in real life? At my school we have been pushing for connections with university pHd students and current scientists. Through the University of Technology, Sydney (UTS), our students have been lucky enough to go to the university regularly and hear about current research conducted pHd students and meet scientists face-to-face and know that science can lead to a fulfilling career. We have utlised the scientists in schools program to have a scientist come to talk to our students about what she does in her everyday job and why finds her job fun and rewarding. We also ask parents to come to school and speak to our students. This year, we had a parent who works in the communications industry speak to our students about his job, how it requires an understanding of energy transmission and waves and how much he loves his job. 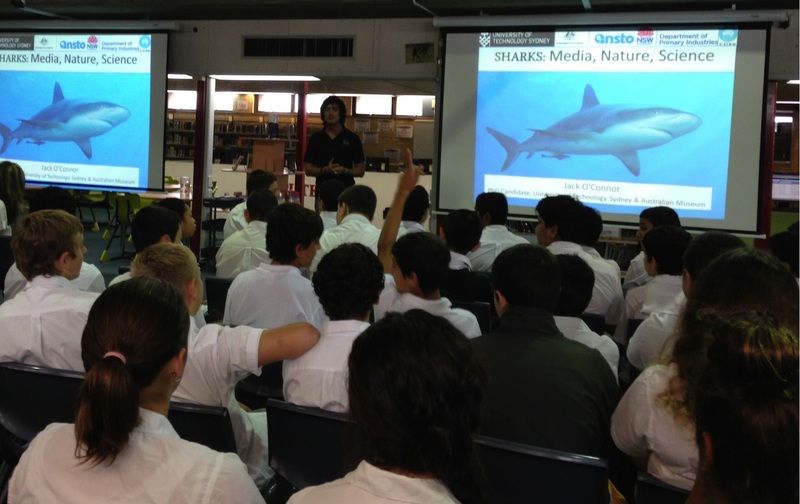 A marine biologist specialising in sharks speak to Year 8s about this job and why he loves being a scientist. And has all this gotten results? Many of our year 10 students apply to attend UTS summer school where they can choose from film, design, science, IT and health over the Christmas holidays. In previous years I have struggled to get any students to apply for the science summer school. Everyone wanted to film and design. After a couple of years of connecting students with university science students and real scientists, we have 12 students apply for science summer school this year. As we are entering the new syllabus for the Australian Curriculum in NSW, it is time that science teachers re-think HOW we teach science and how can we work with the scientific community to increase student engagement in science.